Lightly spray a mini muffin pan (48 muffins) with nonstick spray. Prepare the brownie mix according to the instructions on the box. Stir in the mini chocolate chips. Fill each muffin cup 3/4 full with batter. Bake for 18 - 22 minutes or until a toothpick inserted into the center of one cupcake comes out clean. Set aside to cool. Clean and hull the strawberries. Cut off the stems. 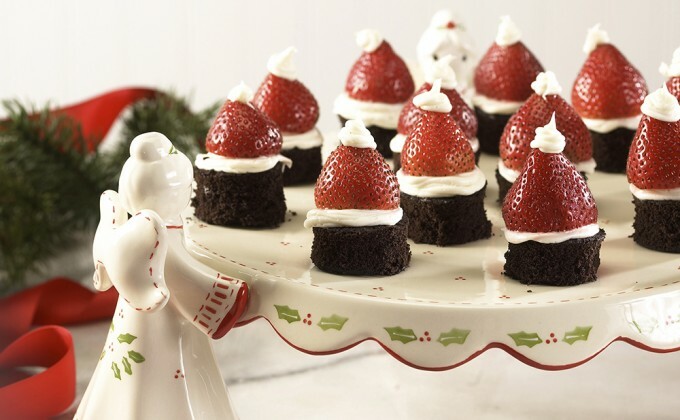 Set one strawberry on top of each brownie bite. Place the white chocolate in a microwave safe bowl. Cook in 30 second increments until smooth, stirring often. Pour into a piping bag fitted with a small round tip. Pipe a ring around the base of each strawberry and a small dot on top. Work quickly as the white chocolate will dry fast. Arrange on your angel cake plate to serve.